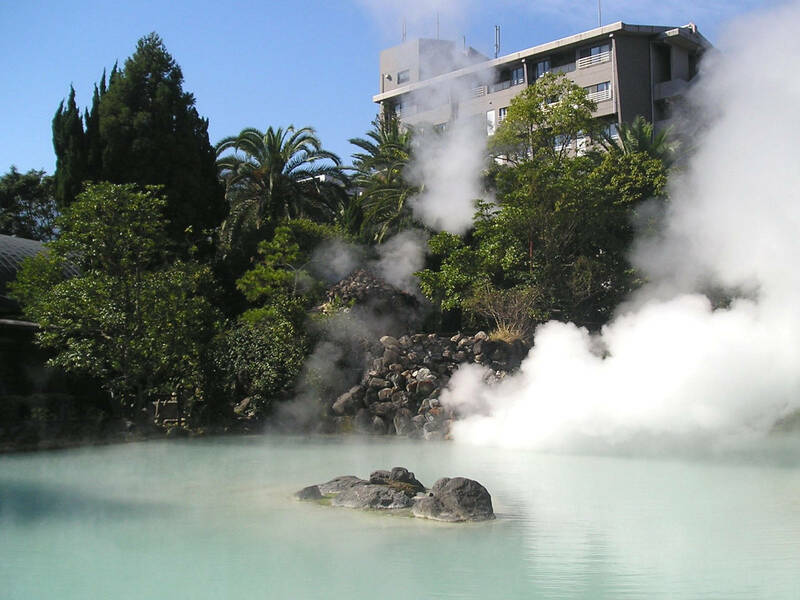 Beppu is a city of about 130,000 inhabitants, which belongs to the prefecture of Ōita and is located along the north-eastern region of Kyushu. Beppu is considered one of the three main and largest spa towns of Japan, for which the city is full of onsen, the main attraction of the city. 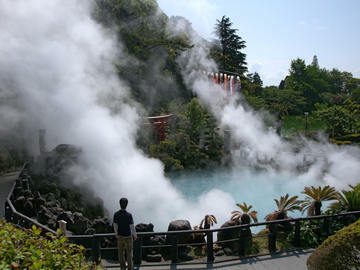 Hot water comes out from underground at a rate of 130,000 tonnes per day, and for this reason Beppu is considered the second place in the world as for quantity of thermal water, the first one is Yellowstone National Park in the USA. 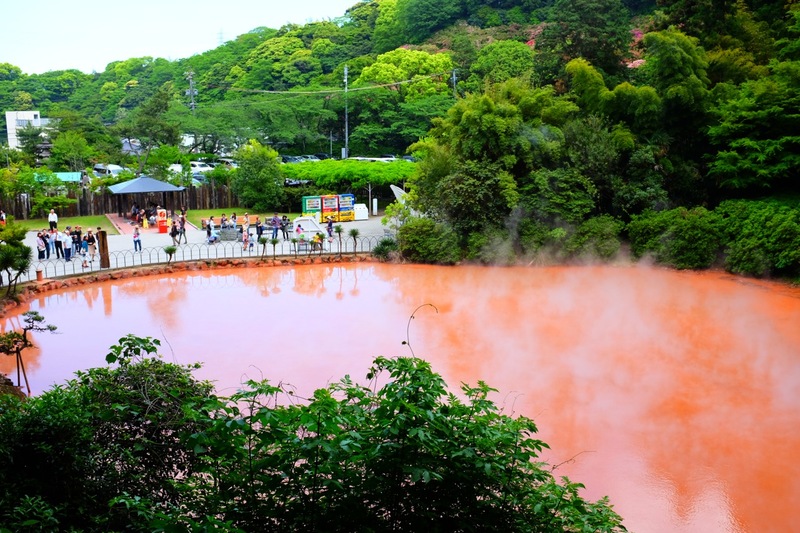 Beppu Hatto is a name that refers to all of the eight major hot spring areas of Beppu City, the most famous of which is called Beppu Onsen. 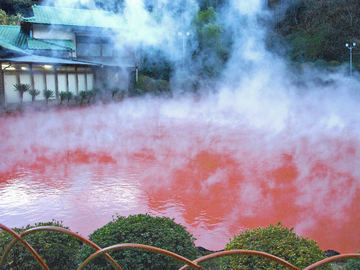 This hot spring is located near Beppu station, surrounded by some ambiguous red light places. The most famous onsen complex is called Takegawara: you have to pay 100 yen only to enter the thermal baths, but its most popular attraction are the sand baths (1030 yen), where you will be covered up to the neck from the hot sand. 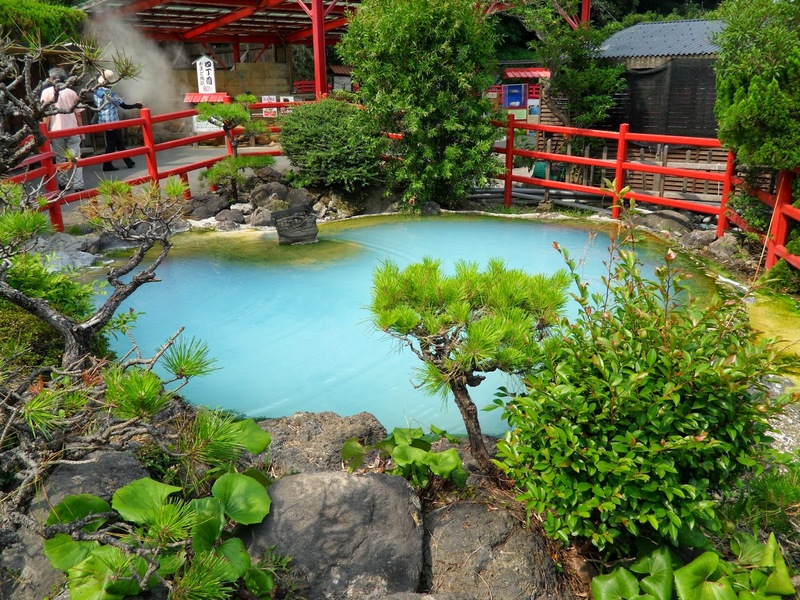 The other spa areas scattered throughout the town are: Hamawaki Onsen, Horita Onsen, Kamegawa Onsen, Kankaiji Onsen, Kannawa Onsen, Myoban Onsen, Shibaseki Onsen. 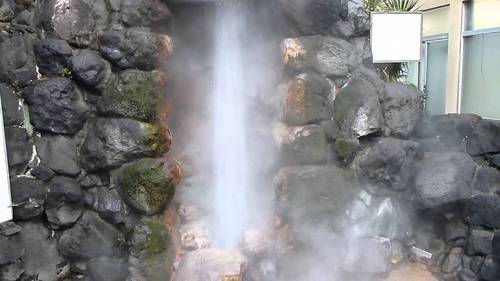 In the areas of Kannawa Onsen and Shibaseki Onsen there are some of the most famous attractions of the city, well known as Beppu Jigoku. The japanese term "jigoku" literally means "hell". The meaning of the expression "Beppu (no) Jigoku" means right "The hells of Beppu" and it refers to a number of hot springs, whose water flows from underground at temperatures that are too high to be used for bathing, between 50 and 99.5°C. 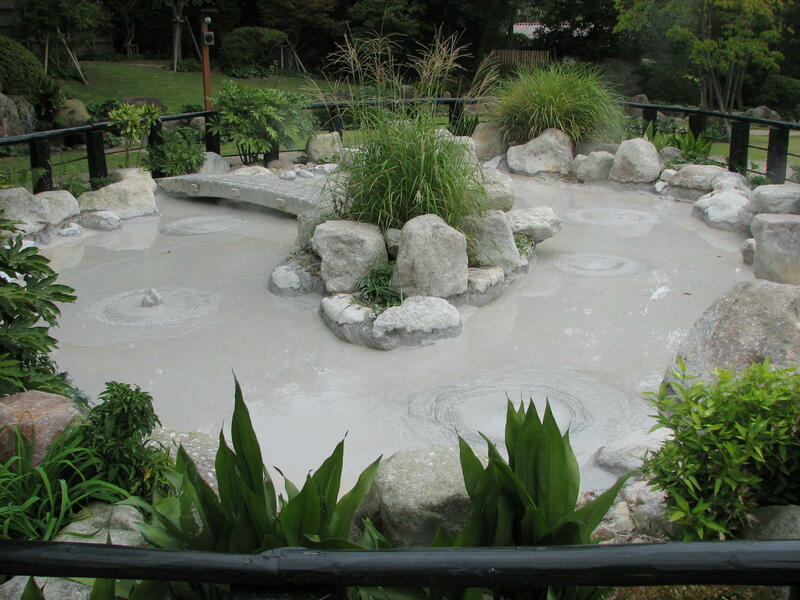 In total there are eight jigoku, eight hells, eight hot springs around which have been set eight particular sceneries, different from each other. The entrance to each of them costs 550 yen, but if you want to visit them all, or more than four, you can buy a cumulative ticket that costs 2100 yen. Opening hours 8-17. Six of these hot springs are located in the area of Kannawa Onsen: Oniishibozu Jigoku, Umi Jigoku, Yama Jigoku, Kamado Jigoku, Oniyama Jigoku, Shiraike Jigoku. The other two are located in the area of Shibaseki Onsen: Chinoike Jigoku, Tatsumaki Jigoku. Mount Takasaki, in japanese Takasakiyama, is a small mountain covered with woods, located in front of the sea, a few kilometers south of the town of Beppu in the direction of the city of Oita. You can reach the foot of the mountain by bus from the center of Beppu. The closest bus stop is called right "Takasakiyama", served by lines AS60, AS61, AS54, AS70, AS71. The first two ones can be taken from Beppu station (east exit). 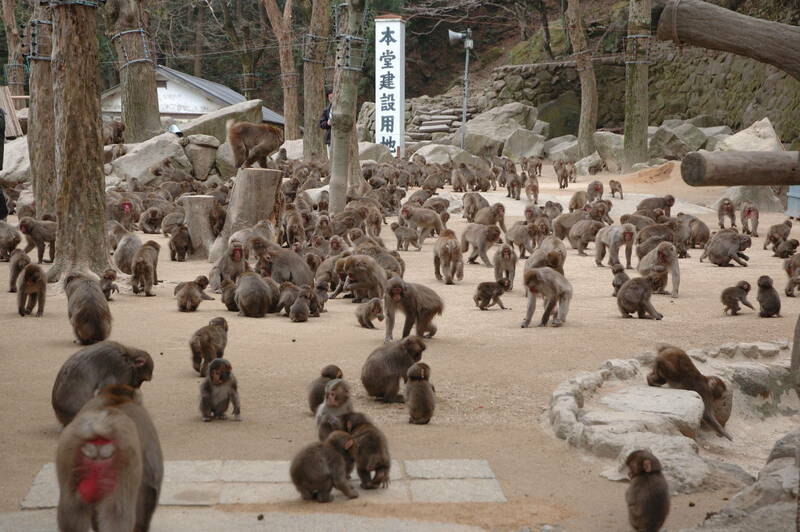 At the foot of this mountain and near the above-mentioned bus stop there is the entrance and the ticket office of a nature reserve inhabited by about 1500 monkeys, belonging to the species of the so-called Japanese macaques (the same species living also in the worldwide famous park of Jigokudani). In other guides this place may also be referred to as Takasakiyama Natural Zoo. Once inside the reserve, you can see the monkeys living freely in the park without restriction. Climbing up the mountain for about 5 minutes, on foot or by a small monorail (100 yen), you get into a sort of "playground" where monkeys congregate and spend their time, while some insiders explain various things and at certain times of the day feed fhe animals. 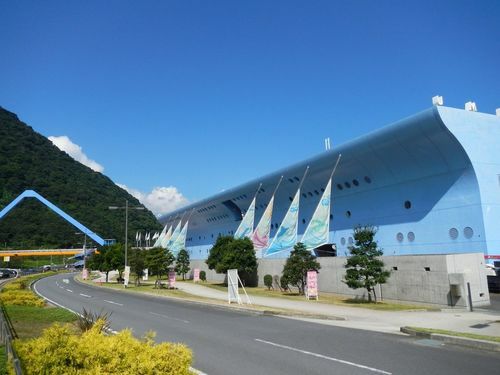 This aquarium, also known as Umitamago (literally, "Sea egg"), overlooks the sea at the foot of Mount Takasaki, and it can be reached from the visitor center of the Monkey Park through a large pedestrian bridge that passing over a highway. Among the various marine species, there are also otters, seals and penguins. 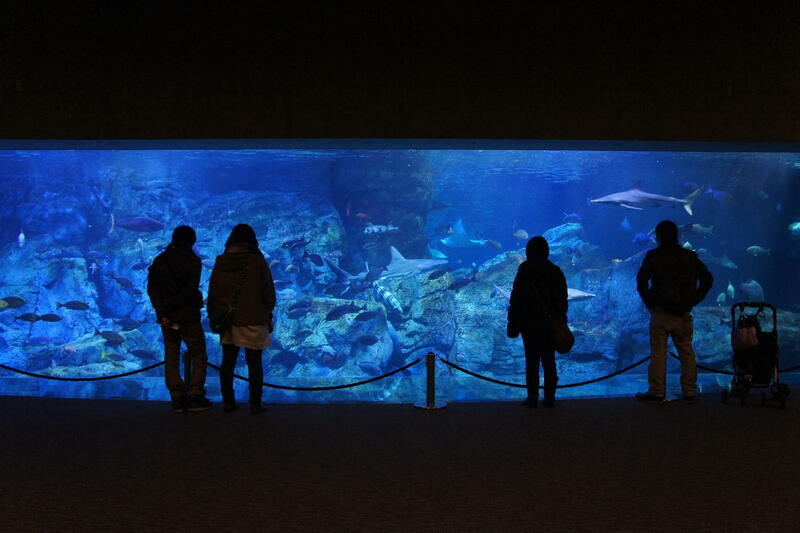 One of the most popular attractions of the aquarium are the shows with dolphins. An aquarium as many others, often very crowded and to be definitely avoided on summer weekends, to be taken into consideration only if you are already in the area. 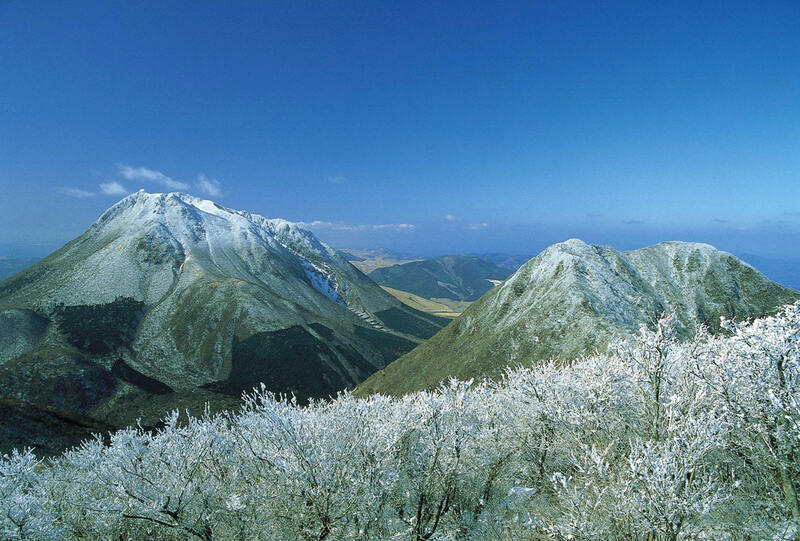 Mount Tsurumi is a 1,375 meters high mountain that rises behind the city of Beppu, to the west. 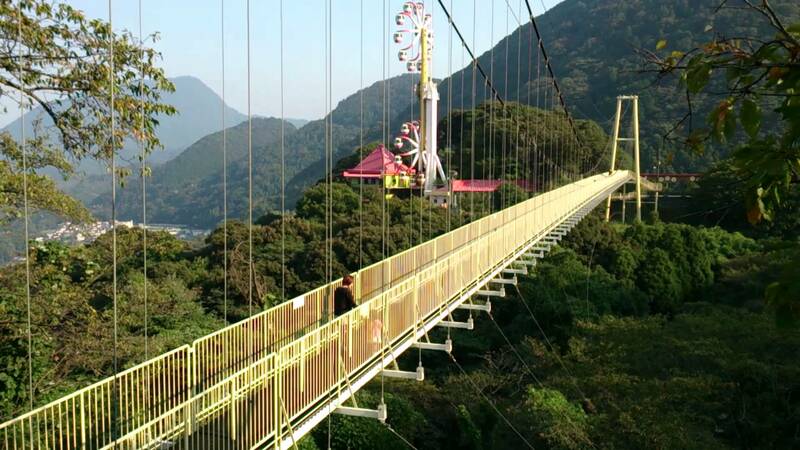 You can climb up to almost the top of the mountain by ropeway (Beppu ropeway), or walking for about 2 hours following a path that starts from the lower station of the ropeway. 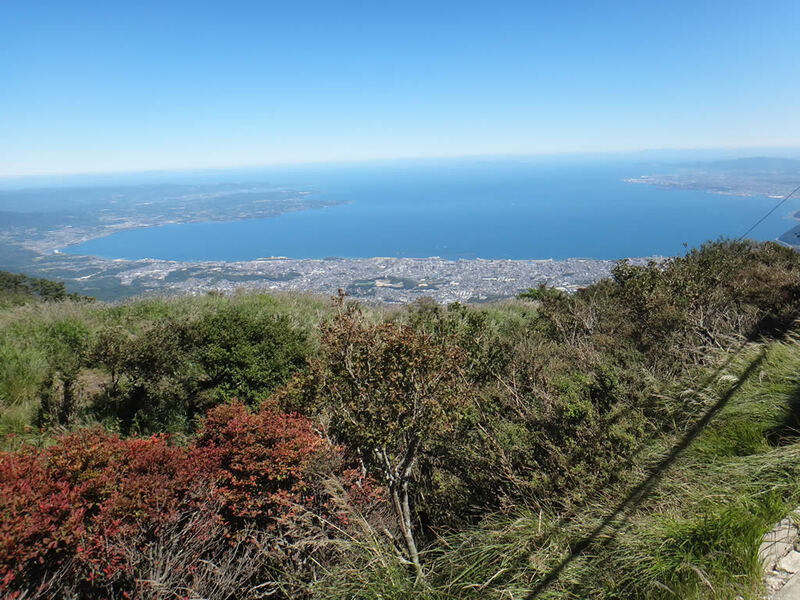 Once you get off the ropeway you will end up in a park with various viewpoints over the city of Beppu, the sea and other surrounding mountains. Walking for another 15 minutes you can reach the highest peak, but there are many trails in the area that lead to several minor peaks. (100 yen one way, 1600 yen round trip, opening hours 9-17) This ropeway will take you to the summit of Mount Tsurumi. 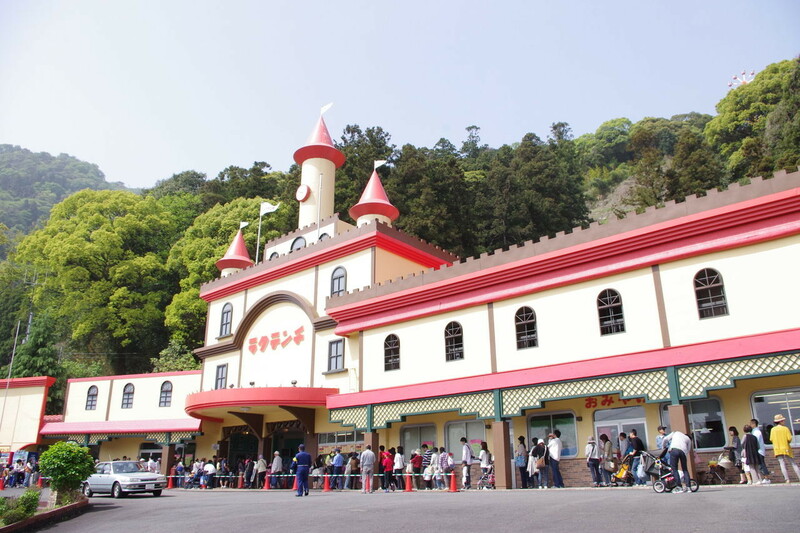 The valley station of the ropeway is located out of town, but it is connected to Beppu Station by four bus lines (#33, #34, #36 e #37). About 2000 cherry trees paint of pink (the pink of the blooming cherry trees) the area surrounding the bottom station of this ropeway, every spring, in April. 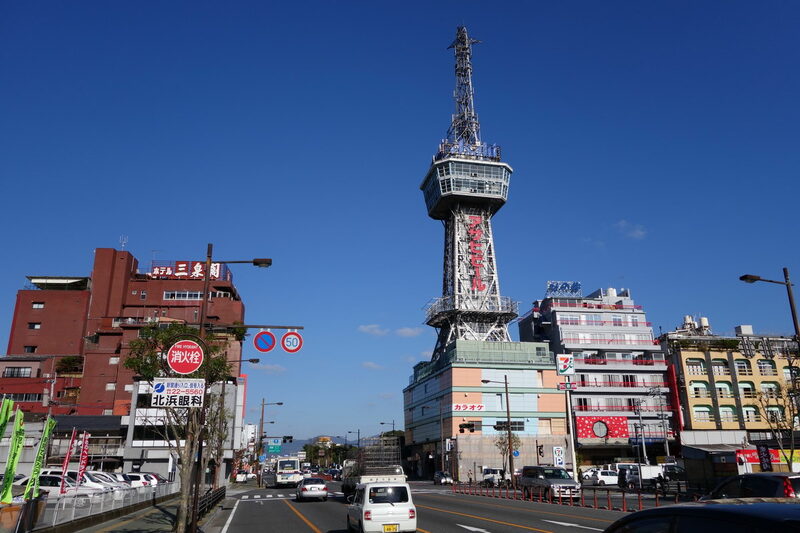 This telecommunications tower, 100 meters high, was built by the famous architect Tachu Naito (the same one of the Tokyo Tower) and inaugurated in 1957. At about 55 meters in height (17th floor) there is a 360 degrees observation deck which is accessed directly by lift. One floor down (16°) there is a lounge bar (opening hours 18-1 am) where you can sip a cocktail at reasonable prices (from 300 yen) in front of the lights of the town of Beppu. Located next to the convention center called B-Con Plaza, this 125 meter high tower has a fully glazed observation deck at 100 meters above sea level. An old amusement park inaugurated in 1929, with an old-fashioned atmosphere. The location is very particular, the park is in fact surrounded by mountains and woods, and from several points you can enjoy a beautiful panorama. To reach it you have to take curious little trains (included in admission ticket) that will take you up the hill where the park itself is located. The departure station of these trains is situated about 1.5 km west of Beppu station. 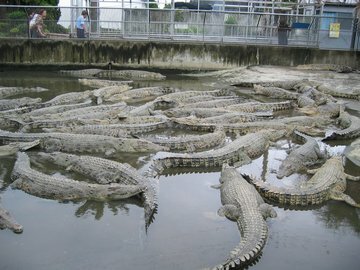 Among the various attractions, the most interesting are a two-story ferris wheel, a roller coaster, an area where you can closely observe various animals (goats, donkeys, monkeys, peacocks, etc. 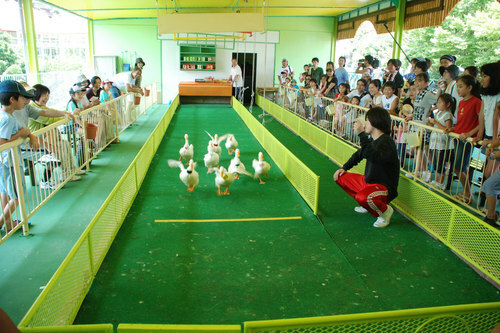 ), and the duck races,real races between ducks on which you can place bets. A visit is recommended especially if you have children with you. 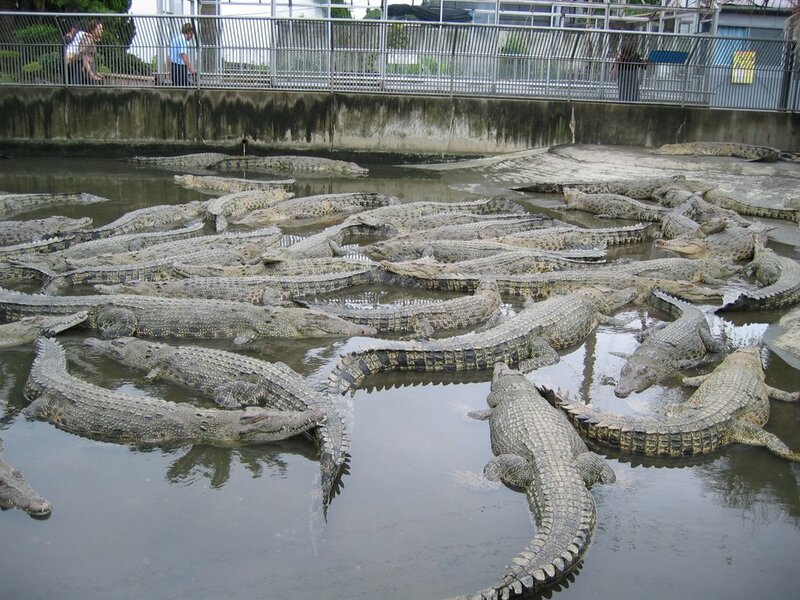 You can find a detailed review of the park on the excellent website Themeparkreview.com. This art museum (OPAM) was opened in 2015 and is housed in an interesting building designed by the renowned architect Shigeru Ban, which is already in itself an element of interest. The permanent collection is not really very valuable and is made mostly of works of local artists, in particular Tanomura Chikuden, Fukuda Heihachiro and Takayama Tasuo. 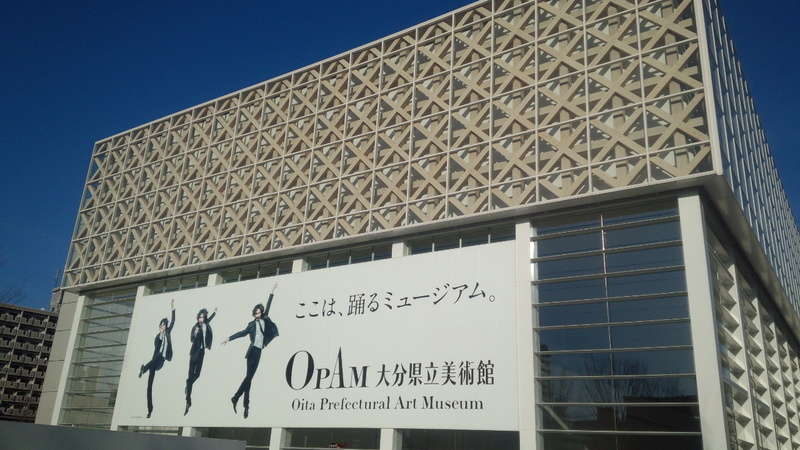 You can check the calendar of temporary exhibitions held in this museum (separate admission) at this link. (opening hours 9-21) This place is located in the area of Kannawa, nearby some jigoku. It can be considered a particular kind of public kitchen. 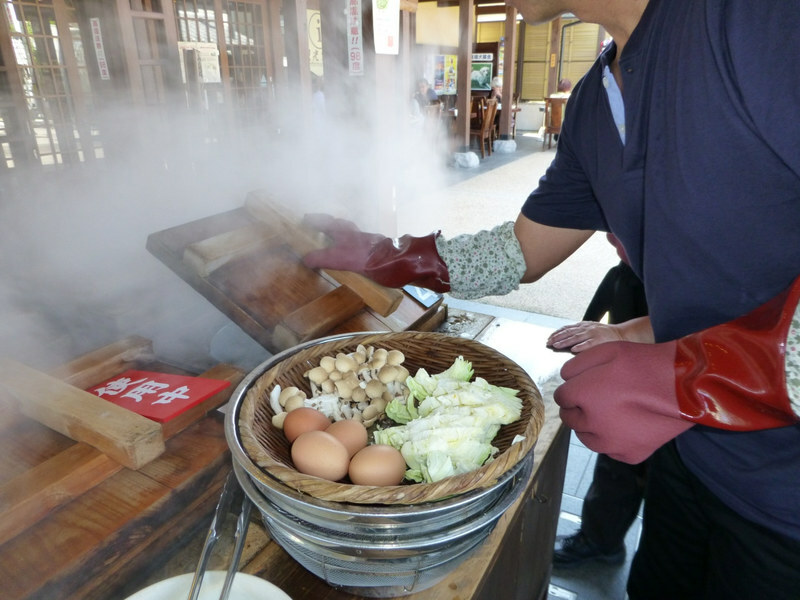 In this place you can bring your own food and cook it steamed, using thermal steam, or buy food on site (reasonably priced) and then cook it, always obviously steamed. By paying 510 yen you will be given a private cooking corner that you can use for 30 minutes. If you need more time, every 10 additional minutes will cost 150 yen. Once you finished cooking you can eat on site on the various tables available. On the spot you can also find dishes, chopsticks and various utensils available to all. For any need you can ask some people working there as volunteers. Besides being a great place where to eat, this place is also great for relaxing, there are two onsen for feet with free admission: one is the traditional footbath with thermal water in which to dip your feet, the other one is instead a particular steam footbath. A small guest house 3-minute walk from Beppu Station, highly recommended for backpackers. 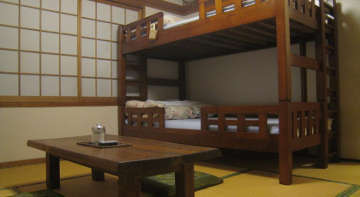 Dormitory beds divided by gender from ¥ 1,700, single rooms with tatami mats and futons from ¥ 2,700 per night. Free WiFi and PC, laundrette, shared kitchen and shared bathrooms, bike rental (500 yen per day). A hostel belonging to a famous Japanese chain, located 8 minutes walk from Beppu Station, highly recommended for backpackers. 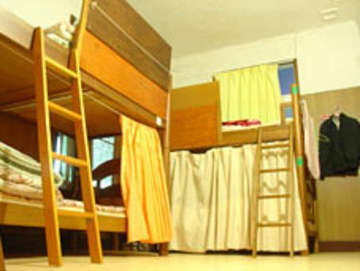 Beds in mixed dorms from ¥ 2,000, single rooms with tatami mats and futons from ¥ 3,000 per night. Wifi, laundrette, kitchen and shared bathrooms, free bikes. If you are looking for a normal hotel, cheap but with all the standard amenities, this is the best hotel in Beppu. 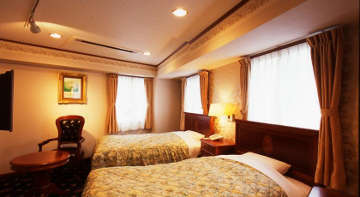 Located just 2 minutes walk from Beppu Station, it offers single rooms from ¥ 4,000 per night and double rooms from ¥ 5,500. All rooms have private bathroom, air conditioning, satellite TV, kettle and all the various facilities. 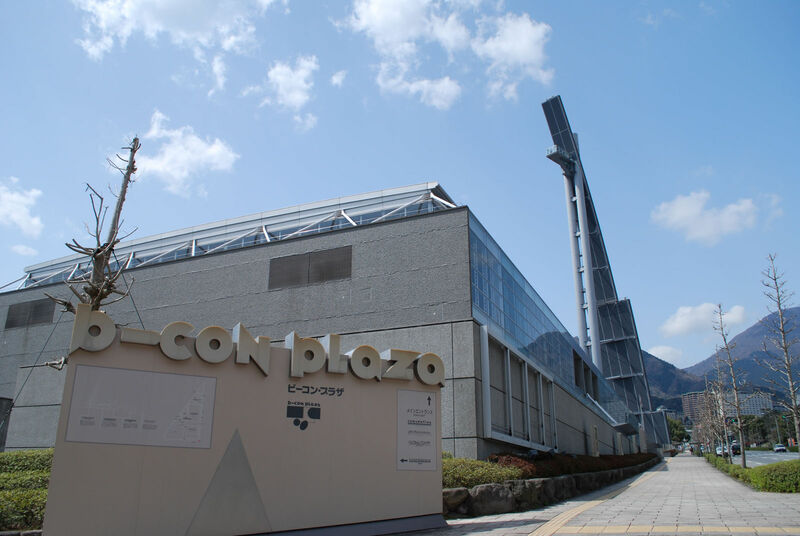 Public baths with thermal water, massage service and a restaurant where to enjoy breakfast buffet (600 yen per day) are also available to guests. 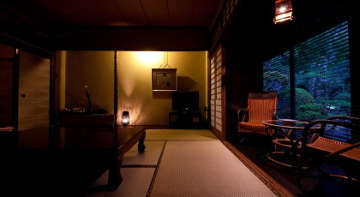 If you want to experience a traditional ryokan without spending much (ryokans tend to be very expensive), this low-priced ryokan with medium quality can be the ideal solution. It is located on the waterfront of the city, not far from Beppu station. Double rooms in Japanese style from ¥ 10,000 per night, raising to ¥ 12,000 if you want to include the traditional Japanese breakfast, or ¥ 23,000 for the half board which also includes a wonderful dinner based on fish at the hotel restaurant . An onsen with a magic atmosphere created by soft lighting is also available for guests. If you are looking for a high-level ryokan where to experience strong emotions but do not want to spend a fortune, this excellent ryokan may be the right choice. Just two minutes far from Beppu Station, it offers beautiful and spacious rooms, overlooking a garden, from ¥ 17,000 for two people, including a traditional breakfast. At the onsite restaurant you can also enjoy the delicious kaiseki cuisine and the famous pufferfish (fugu). 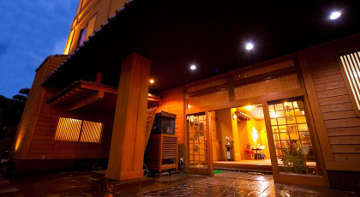 Large shared onsen with hot spring water and smaller hot spring baths for private use are also available to all guests. Beppu is not directly served by bullet train lines (shinkansen). The closest shinkansen station is Kokura station, about 140 km to the north, served by the Sanyo shinkansen. Obviously, you can reach this station from all cities served by shinkansen further north, for example, from Tokyo (at least 5 hours, 21,490 yen), Osaka (135 minutes, 13,940 yen), or Hiroshima (50 minutes, 7,330 yen). Once in Kokura, in order to get to Beppu you have to change your train and take a limited-express train called Sonic (70 minutes, 4020 yen to Beppu). Fukuoka is the starting station of the above-mentioned limited-express Sonic trains, which makes an intermediate stop at Kokura station. From Fukuoka, the entire trip to Beppu takes 2 hours and costs 5,500 yen. You can save by purchasing a set of two tickets, that can be used by two different people or by the same person for the round trip, it costs 6,180 yen. Even cheaper is a set of four tickets, it costs 10.280 yen. The fastest way to get to Beppu from Kumamoto is to take the Kyushu shinkansen up to Kokura, and once there change to the already mentioned limited-express Sonic train. It takes about 2 hours and a half to cover this journey, which costs 11,000 yen, you can use the Japan Rail Pass for the whole journey if you have it. If you do not have the Japan Rail Pass, you can consider taking a slower but much cheaper train, the limited express Trans-Kyushu, which takes about 3 hours and costs 4,930 yen (only 4-5 trains per day). You can save by purchasing a set of two tickets, that can be used by two different people or by the same person for the round trip, it costs 6,680 yen. Currently we are not aware that there are direct bus connections between Tokyo/Osaka and Beppu, or even if there should be something, there is no information in English on them so it would be difficult to use them for foreign tourists. Getting to Beppu by coach is instead a good alternative if you come from other cities of Kyushu region such as Fukuoka, Kumamoto or Kagoshima. The Kyushu Odan Bus of the Kyusanko bus company connects Kumamoto and Beppu in about 6 hours, the one-way ticket costs 3960 yen. These buses also make an intermediate stop at Aso station (Mount Aso). This website (also available in English) has been realized through a collaboration between all the major bus companies operating in the region, you can use it both to check the timetables and to book online. The closest airport to Beppu is Oita Airport (OIT), located about 40 kilometers to the north along the road to Kunisaki. This airport is served by both major airlines JAL (Tokyo Haneda, Osaka Itami) and ANA (Tokyo Haneda, Osaka Itami, Nagoya Centrair), and low-cost airlines: Solaseed Air (Tokyo Haneda) and Jetstar Japan (Tokyo Narita, Osaka Kansai). The port of Beppu is connected by ferry to Osaka and Yawatahama (Shikoku). This ferry company Ferry SunFlower operates a daily connection between the port of Beppu and a port in the area of Osaka (the Osaka South Port). Ferries depart in the evening and arrive early in the morning at your destination, for a total of about 12 hours of navigation. Prices range from 10,300 yen for the "Tourist" class, where you sleep in large rooms with tatami mats and futons shared with other passengers, up to 26,100 yen for a "deluxe" private room. More details on all available accommodation and other information on the official website of the company (also in English). If you want to book online, I recommend the international Aferry. Yawatahama is a port situated on the southern coast of the Shikoku region. If you want to reach Beppu from this region, this ferry is a great solution. You can reach Yawatahama from major cities of Shikoku (Matsuyama, Takayama) by train. The ferry company Uwajima Unyu Ferry operates six connections per day between Beppu and Yawatahama. The sailing time is about 3 hours and a one-way ticket costs 3,000 yen. This one is the company's official website (in Japanese only).